Easter is, perhaps, one of the most beautiful andImportant church holidays, which both adults and children love. Easter is a passing holiday, therefore every year the date of celebration is different, but always falls on Sunday. Believers strive to celebrate this great spiritual festival as best as possible, therefore preparation begins in advance. And it's not just about making a menuA festive table and the release of the house from all unnecessary and cleaning in it, besides this they take care of decorating their home and preparing thematic gifts for their relatives and friends. One of the most popular hand-made articles,On a par with the variously made and decorated egg-eggs, symbols of the rebirth of a new life, are Easter baskets. They will become very beautiful "Packing" For those very pisanoks that are exchanged on this bright day. 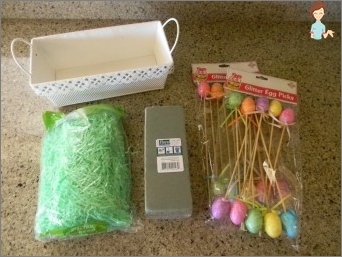 The simplest version of the Easter basket is an article made from materials that are sure to be found in any house where there is a child, that is, paper and cardboard. If you have a ready roll of paperTowels, cut it into three equal parts, so that the basket was not too high. If you do not have such a roll, take a piece of thick paper, make a roll and glue with PVA glue. Further from the strip of corrugated paper or lace you need to make "Skirt" For the basket, fix it with glue. Lace must be pre-baked in order to "Skirt" Turned out neat. Cut out the cardboard handle for a basket with a length of 15Cm, decorate it with lace or corrugated paper and to a depth of 1 cm on each side of the glue inside the basket. Outside, a basket-stand for Easter and a pen can be decorated with decorative paper flowers and real beads. Recently, great popularity has foundSuch a technique of making various crafts, paintings and decorations for the house as a quilling. This technique of paper-wrapping or paper filigree carries away from the first minutes of acquaintance with it and immediately there is a desire to make something of that sort. A great way to try your hand at this art will be making an Easter basket for eggs. First you need to prepare the base of the basket - the box. To it it is necessary to paste a wide handle from a cardboard which length will depend on the size of the box. After that, the box and its handle must be pasted with colored paper both from the outside and from the inside and leave until it completely dries. Now you can start preparing the elements. To do this, from two-sided colored paper carefully and very smoothly cut strips with a width of 0.5 and 1.0 cm. Of these, using quilling toolsIt is necessary to make blanks of the desired shape and color, and after they have completely dried, you can begin to glue them to the box. 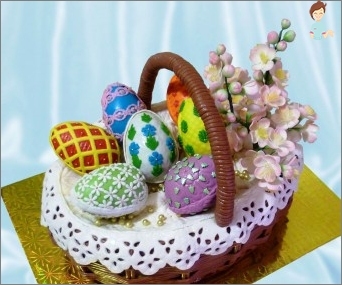 Most often for decoration of Easter baskets the flower theme is used. If you have a lot of different coloredShreds of cloth, do not rush to get rid of them and send them to the trash. 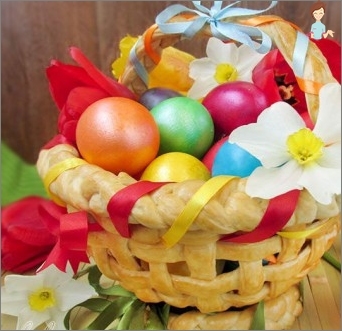 They can become a beautiful and elegant basket for eggs for Easter made by own hands. Sewing machine (you can do without it). To work it was convenient and nice first allShreds of fabric should be brought to the same width of 7 cm. After that, they need to be sewn together, to get a fairly long strip width of 7 cm. Now you can start decorating the rope with the help of sewn cloth flaps. They need to wrap the rope in a spiral, but so that there is not "Gaps", The edge of the patchwork tape can be sewn to the edge of the rope for convenience. As the patchwork ribbon ends it will need to be sewn. Determine when there will be enough lengthDecorated rope can only be experienced, because it all depends on the size of the bucket. To do this, it is necessary to wrap the decorated bucket rope from the bottom up. After the decorated rope is neededLength made, you can proceed to decorating the bucket-basket. You need to start from the bottom of the bucket. The resulting cord should be twisted around the bucket and sew the rows together. They must fit together tightly, so that the basket is neat and durable. If you have a glue gun, you can glue the edge of the rope at the very beginning of the winding to the bucket, so that it is more convenient to reel it. The handle and the bottom are made in the same way. 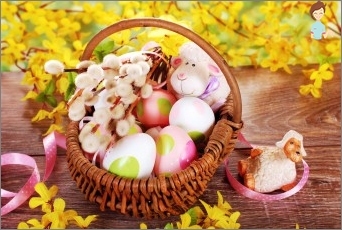 An additional decor does not require such a basket for Easter, but if desired, it can be decorated, for example, with a satin ribbon or a bow. Very original and interesting Easter crafts are made from salted dough, to cook and use which is very simple. To make it, you need a small salt («Extra»), Flour and water, taken in the proportion of 1: 1: 0.5. If the dough turns dry, you can add a little vegetable oil. In addition, to make a basket of doughAt Easter, a deep bowl or bowl will be needed, which will serve as a mold for modeling and food film. The number of ingredients for preparing the dough is based on the size of the basket you are going to get. The plate turns upside down andCovered with 2 layers of food film. Then on it a solid layer of 0.3-0.5 cm thick spreads dough and over it decorative elements - flowers, leaves, butterflies from the same puff pastry. You can just simulate the weave of the basket. The handle of the basket must be made from two twisted Sausages From the dough. After it dries it needs to be carefully attached inside the basket with two pieces of dough. After the test has completely dried, the structure can beWill colorize. Acrylic colors are best for this. 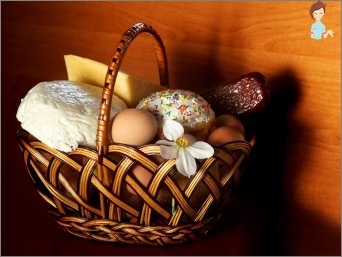 Usually Easter baskets are made in colors close to brown, and decorated with colorful elements. Now you know how to make and decorate a basket by your own hands for Easter, so you can always please and surprise your friends with a gift.